New York State Senator Thomas K. Duane and New York State Assemblymember Brian Kavanagh were joined today by Congressmember Carolyn Maloney, Manhattan Borough President Scott Stringer, New York City Councilmember Dan Garodnick, members of the Stuyvesant Town-Peter Cooper Village Tenants Association (ST/PCV-TA), tenant advocates and community leaders at a press conference announcing legislation they will introduce requiring landlords to pay attorney's fees and/or expenses incurred by tenants wrongly accused of breaking rent-stabilization regulations. In cases where a landlord is found to have knowingly served a notice containing facts or allegations that are not true, the landlord shall be liable for three times the tenant’s legal fees. 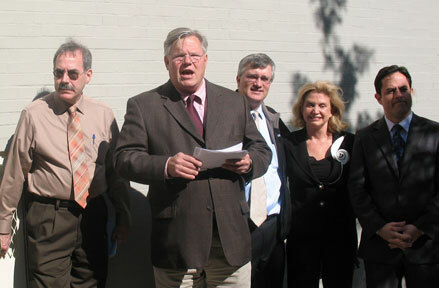 The press conference preceded a general meeting of the the ST/PCV-TA, which has been helping many legitimate tenants of the complex fight baseless legal notices. "It is time we stop landlords from using the legal system as a means to harass tenants. This far-reaching legislation will serve as a strong disincentive for landlords to engage in deliberate intimidation and harassment of tenants by serving notices in bad faith," said Senator Duane. "All too frequently, I hear from worried constituents who have been served notice by landlords to cure violations of their leases or notices of lease non-renewal or termination which are completely groundless. Tenants who are victims of these scams presently have no financial recourse when they retain legal counsel to determine the meaning of and/or to respond to such notices unless the matter proceeds to court and there is a judgment against the landlord. This is both costly and cruel for those who are wrongly accused and it is time we stop it." "Baseless challenges cost tenants time, money, and-in the worst cases-their homes," said Assemblymember Kavanagh, who passed a bill in the Assembly earlier this year that would allow tenants to recover attorneys' fees and damages in cases where landlords act in bad faith to bring non-primary residence eviction proceedings. "Landlords who act in bad faith and harass rent-stabilized tenants with erroneous and dishonest challenges to their tenancy should be required to pay the price. This bill aims to provide even broader protections for tenants than the bill we previously considered." Councilmember Garodnick, who in July called upon Tishman Speyer, the owner of Stuyvesant Town and Peter Cooper Village, to voluntarily pay the legal bills of any falsely accused, legitimate tenants of the complex, said, "This legislation would make into law the moral obligation that I posed to Tishman Speyer  to do right by tenants, and pay for the costly and unnecessary legal fees they incur. I credit my colleagues in Albany for going even further to protect tenants, by adding strong financial penalties for landlords who knowingly serve the false legal notices that burden residents and the courts." Said Congressmember Maloney, "Too many landlords are going on fishing expeditions and forcing tenants to prove themselves innocent in order to keep their homes. In 339 cases at Stuy Town and Peter Cooper alone, the landlord was found by the courts to be wrong. When landlords abuse the system, there should be consequences." Al Doyle, President of the ST/PCV-TA, observed, "So many tenants have been unjustly served with Golub notices, everyone is now extremely nervous when their leases comes due, even though there is no reason to worry. Just because a second address shows up in a credit check is no reason to assume this isn't the primary residence. Tenants may have inherited a second home from their parents or have a rental property elsewhere. The landlord is using the most tenuous facts to create an atmosphere of fear." The bill is expected to be introduced in the Senate and Assembly the week of October 20.